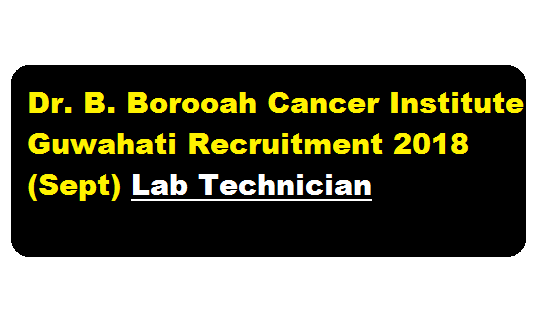 Dr. B. Borooah Cancer Institute Guwahati Recruitment 2018 (September) – Laboratory Technician Post :- Dr. B. Borooah Cancer Institute Guwahati has published a recruitment notification recently. According to the recruitment , Dr. B. Borooah Cancer Institute. Guwahati requires Laboratory Technician to be recruited on ad-hoc basis. Eligibility : B.Sc with DMLT from a recognized institution. One year experience in Hospital. Age limit :- Below 30 years. Appointment will be made for one year. Interested and eligible candidates may report for walk-in-interview with complete bio-data supported by copies of certificates and testimonials before the Selection Committee on 03.10.2018 (Wednesday) between 9:00 AM to 10:00 AM in the Conference Hall of the Institute. The decision of the Institute as to eligibility or otherwise of a candidate will be final. The number of post indicated in this advertisement is estimation only. Actual number of post may vary at the time of recruitment. No TA/DA would be paid for appearing in the interview. Please note that canvassing bribing in any form will be a disqualification and would lead to cancellation of candidature.